Filipino Astronomer. From the Philippines to Jupiter! Filipino, Christopher Go first observed the skies using 10X40 binoculars when he was in high school. Having graduated from the University of San Carlos with a degree in Physics, Go then pursued his dreams of becoming an astronomer. Last July 4, history in astronomy was made when NASA’s Juno spacecraft investigated the planet Jupiter. This will lead to a better understanding of our solar system. Go is part of a team of scientists, 13 planetary scientists and 6 amateur astronomers who lent support for the Juno mission. The Juno spacecraft was launched last August 5, 2011 and reached Jupiter last July 4, 2016. 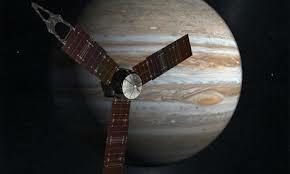 Its aim was to better understand the state and evolution of Jupiter’s atmosphere. The Cebuano Christopher Go has been imaging Jupiter for more than 10 years and was tapped by NASA to be one of the support scientists. "I’ve been imaging Jupiter since 2004 and have worked for many years to develop collaborations between amateur and professional astronomers. Amateurs have the advantage in that they don’t have to apply for telescope time, and the equipment now available means that we can make very high-quality observations," Go disclosed. "I am delighted that the amateur community has been invited to collaborate on Juno and excited at the opportunity to make an important contribution to the mission." he added. His first major discovery was Red Spot Jr. wherein he observed the planet’s Oval Ba white turn red. Go was accepted into the American Astronomical Society and its Division for Planetary Sciences after the discovery. It was in June 2010 when together with astronomer Anthony Wesley that they were able to capture an image of a fireball exploding on the surface of the planet Jupiter. "This is where amateurs fill the gap, this is how we basically contribute to the science of astronomy," Go said in a feature by telescope manufacturing company Celestron, "It might just be an image, but that image is a useful data that professional astronomers need to basically understand the universe."